From my last week’s trip to Hypercity, a supermarket near us, I ended up buying beautiful cherries and strawberries. Although it is not summer, we do have a great variety of imported fruits available throughout the year. I also had apples, bananas, pomegranate and oranges (from the local market) left over from the festival offerings. I wanted to use up all of these without wasting anything. Also, I wanted to not end up making any calorie-rich dessert out of these. I resisted the temptation and decided to make a fruit salad. This is a Fruit salad that is nutritious and healthy. Equally tasty as it is healthy, requires no additional sweetening of any kind if you use ripe fruits. Fruits are packed with vitamins, minerals, anti-oxidants, fibre and many phyto-nutrients. 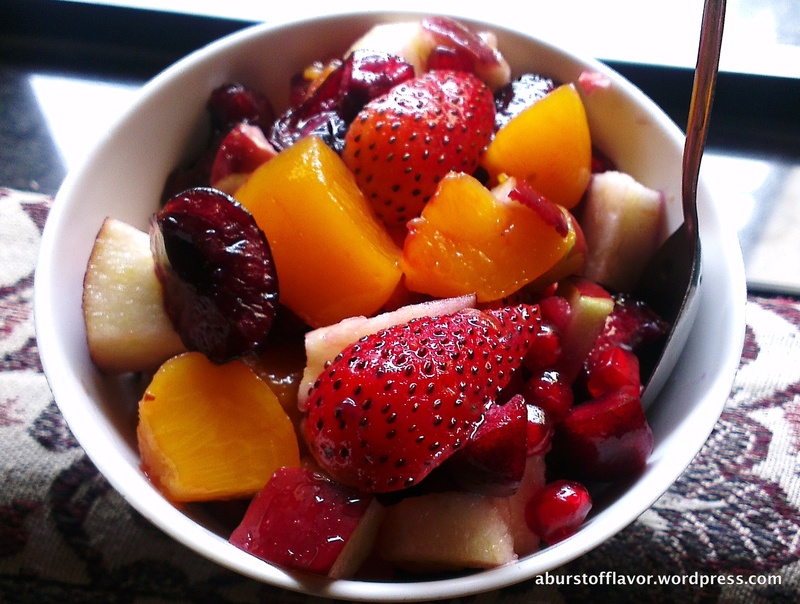 One bowl of this fruit salad everyday is a step towards balanced nutrition. Feel free to use any combination of fruits you would like other than ones listed below. There is no recipe as such, the only twist is the addition of orange juice. You can replace that with lime juice, add some chopped mint, vanilla – The world is your oyster! Mix all the fruits with orange juice in a big mixing bowl. Chill and serve.